Ginger, cumin and cinnamon add a touch of flavour to this braised chicken entrée. 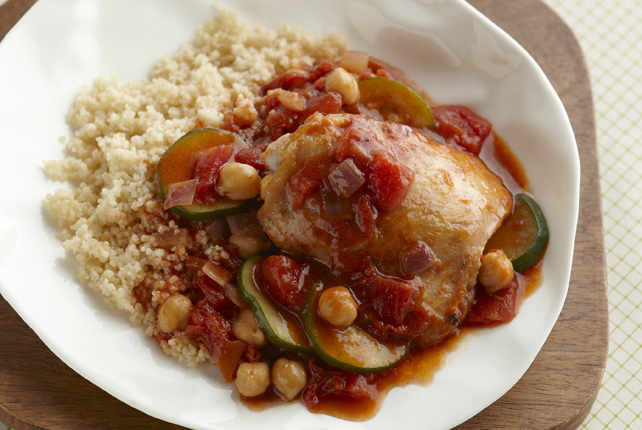 Slow-simmered with onions, tomatoes, chickpeas, and zucchini, these chicken thighs are served with a side of hot cooked couscous. Cook chicken and onions in hot oil in large skillet on medium heat 5 min., turning chicken and stirring onions after 3 min. Add next 3 ingredients; cook and stir 1 min. Stir in all remaining ingredients except couscous; bring just to boil. Simmer on medium-low heat 25 min. or until chicken is done (170ºF). Meanwhile, cook couscous as directed on package. Serve chicken mixture spooned over couscous. Garnish with 1/4 tsp. chopped cilantro just before serving. Add a few tablespoons dried apricots, raisins or currants to chicken mixture with tomatoes and chickpeas. This fantastic combination of flavours makes this recipe a great choice for a weeknight meal. As a bonus, the tomatoes provide a good source of both vitamins A and C.